Imogen specialises in Osteopathy. She uses both the basic structural approach to Osteopathy, as well as Cranio-Sacral Therapy, which can be used safely on new born babies and on some people for whom basic osteopathy is not suitable. Imogen has two young daughters, and this in part has lead to her expertise in more specialist and alternative forms of Osteopathy. Imogen is passionate about Osteopathy, and considers herself very fortunate to work in a job that she loves. Her special interests include the Osteopathic treatment of babies and children, as well as women during pregnancy. Imogen also has a commitment to the treatment of rugby players/sports players and is heavily involved in supporting a local rugby club ensuring the availability of treatment for young players. Imogen also continues to enjoy treating dogs. At present there is much demand for the treatment of dogs, especially those involved in agility work. 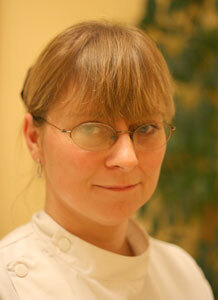 Imogen trained for four years at the European School of Osteopathy in Maidstone, Kent and qualified in 1986. For one year she worked in an Osteopathic clinic close to home and then had an opportunity to move to Nottinghamshire and set up in practice. She bought a house in Eastwood in July 1987 and began running Maple House Clinic in August 1987. initially she worked alone but soon became busy enough to justify taking on another Osteopath. In 2000 Imogen decided that she wanted to further expand her work with babies, children and pregnant mothers. She enrolled with the Osteopathic Centre for Children in London, gaining a Specialist Diploma in Paediatric Osteopathy . Within the course there was some rewarding work within a hospital on a neonatal intensive care unit. This work was exhausting but very rewarding. In the interim, Maple House Clinic had become busier and Imogen took on further Osteopaths allowing her to study further. In 2004 Imogen began working in a special needs school as a voluntary Osteopath. Imogen regards this experience as having been a chance to continue to improve on her experience dealing with children who have very complicated treatment needs. Many of her patients here would not have had the chance to have Osteopathic treatment without her help. She continues to treat children with complex needs within her clinic, both from the school and from the general population, many of whom have been recommended by family and friends. Imogen has also worked part time at a large Ice Rink where she helped skaters, their parents and relatives, and the ice rink staff. She enjoyed the demands of the rink-side Osteopath but the work was partly fuelled by the interest her own children have in the sport. Imogen continues to look for new and innovative ways to help the skaters and sports enthusiasts to train without causing themselves injuries. Imogen also has been working with two rugby clubs. She works with Mansfield Rugby Club three days a week, working with the players before and after their training sessions and also working pitchside during the first team games as their first-aid/medical support team, at home and away. To this end Imogen has completed and passed the RFU Pitchside Trauma Course for which she travelled to London's home of rugby at Twickenham. She continues to look for further ways to improve her skills to help with the treatment of her rugby players and to actively assist in injury prevention or rapid rehabilitation.